I did have a excelent break, when ever the weather permitted we went for walks, cycling etc........ofcourse 2 weeks of doing nothing means having luxury meals , wine, and all the goodies and now I totally can't get into my summer skirts for sure..............I have not had the courage to try them as I know I won't be able to close the last button for sure, so will have to wait for trying them. Yesterday when we were in the shopping street I went to my usual shop with kitchen things and bought a coking thermometer and remarked to hubby and daughter well now one of these days I will be trying a delicous dessert I saw in a blog and now I have this thermometer ( as the recipe used to control the heat) I will be making soon and the remark from my daughter was OH I heard some one saying now the holiday is finished I am going for a strict diet.........and she was poniting to me saying that someone was me..... and I told her I will go for diet after making this particular dessert. Well the dessert has to wait as now this chicken dish is really really yummy delicious. Not to mention real easy to make I have been making this for years and years actually from the time I bought Patchapmans 250 favourites Curries, and that was in 90's. If you look into my copy you will see in most of the recipies which I have made written delicious, nice, not bad, bad etc...........and in this one it is written really delicious. The Chicken meat is given a short marnation, then it is stir fried in the kadai or karahi. Well i use my wok. 675 gm bonless chicken breast. Method1. Dice the chicek breast into bit size pieces, and place in a bowl with the lemon juice and leave for 30 minutes. 2. Heat the oil in a kharai or wokand fry the spices for 1 minute. Add the garlic and ginger and fry for 2 minutes , then add the onions and chillie and fry for few minutes till they are soft and the raw smell is gone from the onions. 3. Add the chicken pieces, and srite fry for few minutes. 4. Now add the curry powder and the tandoori powder and stir well. Fry it for fee more minutes and then add the tomatoes, and futher cook . If the mixture is dry add a bit of water. 5. Now add the cream, corriander leaves, and the garam masala and cook till the chicken is fully cooked. Garnish with corriander leaves and serve with rice or naan etc and enjoy the dinner. The first picture you see in the post is without adding teh food Color . Welcome back! Your holiday sounds lovely. I'm hungry reading your post. Welcome Back HC...very happy to see u back with my favourite dish, such a droolworthy dish:)makes me hungry ..
Hope you had a nice break HC! Weather was wonderful last week (except for Friday). This is really an very easy recipe! Looks like u had a good break. that looks awesome! some kulcha/naan & kaadhai chicken is what i would love for my dinner. meanwhile i'll wait for the dessert. Welcome back! The chicken looks delicious! Kitchen Flavour thankyou , yeah this is my fav too as it is so easy to make. Priya thankyou, my favourite too. Ramya, wow you are ealry with the skirts, i have not bought any new ones in the fear of having to buy a size bigger. Bombay brussels, yeah fes times we had splendid weather and really enjoyed it. Soma yeah me too looking forward for making this particular dessert. Madumathi and 5 star foodie thnakyou. Putting some weight at times is not a sin dear..we can manage na ? Welcome back Happy cook..Chicken is looking mouthwatering..Nice color dear.. Cool happy..I'm on look out for boneless chicken breasts recipes...and this will fit perfectly into my diet. Thanks for posting. Welcome back! Diet u can do it later, first I will drool over ur chicken! Nice step by step Pictures..waiting for the dessert! wow this is a great looking dish,this is totally bookmarked. I love the look of this dish! I haven't seen tandoori powder in my store, I'll have to keep an eye out for it. u are not alone so lets have party with our desserts...ha ha. kadai chicken seems so easy n delicious. must try this. Glad you are back!! Great post too! Nice to see you back. Glad you had a great time with family..Kadai murgh lookd delish..Nice presentation. Good to see you back from your break. 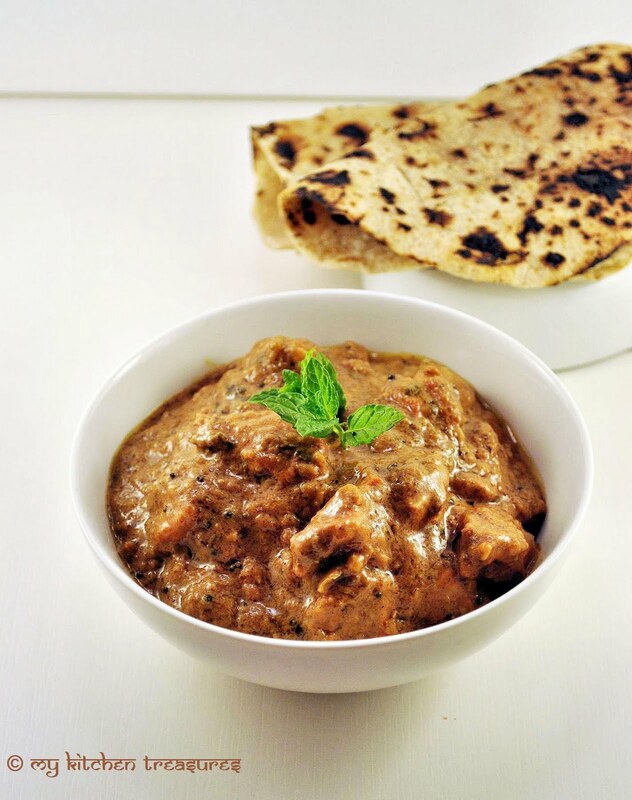 Lovely Kadai Murgh recipe. I have booked marked it and will try it really soon. Looks like a wonderful, spicy sort of chicken! Love the pots too. Anusriram i got the kadai from one of the shops from here. Glad to hear that you had a great vacation! It is dinner time here...I would love to have your kadai murgh with nan...! Happy good to see you back..and with this delicious post , and what more can i ask for ...this makes me hungry :).. SO good to see you back. That pic sure looks yummy.I just love the color-perfect. I am new and will be blogging some Sindhi meat recipes very soon. Welcome back!! This chicken looks lovely!! Gorgeous chicken curry it looks just like what you would find in a restaurant. Oh yum, that chicken looks delectable! Really delicious! your kadai murgh can give a slap to any restaurant-made one and i bet this is much much healthier! Welcome back and thanks for posting another delicious dish that's fit for dipping Naan into it. i guess first time here..lovely blog you have..chicken looks amazing..mouthwatering!! Thank you for being my Taste & Crerate partner. This was absolutely delicious, and so simple to cook. My post is here. I know you posted this recipe a few years ago, but I just discovered FoodGawker a few months ago and found your blog a couple of weeks ago. I never post about how good something may taste once I get around to making a dish. I only post once I've made the recipe and let me tell you this recipe is delicious! I had to make my own tandoori spice because I couldn't find any to buy in bulk at Central Market or Whole Foods here in Houston. I only used 1Tbsp of garam masala (anymore would have been too much for me). I also needed to add a half teaspoon of sugar to mellow out some of the intense flavor. But I'm so proud that I made this dish and it will be my meal for the next 3 days unless one of my daughters come over and raids my fridge. Thanks! @Cozy Thankyou so much for trying my recipe and happy to hear you loved the dish.You can buy in any Indian store the tandori spice in Houston, I was there few months back and there are plenty of Indian store and if you buy from the indian store it will be cheaper than the other shops.